The body that funds Welsh universities has concerns about the financial sustainability of almost half of them. The Higher Education Funding Council for Wales (HEFCW) said five of the country's eleven institutions face an uncertain long-term future. Meanwhile, Higher Education Wales said there was a need to assess the level of contribution graduates in Wales make. Students across Wales are holding protests against an increase in tuition fees. University funding was cut by 12% over three years in the assembly government's draft budget last week. HEFCW chief executive Prof Philip Gummett said the higher education sector faced "challenging financial times for the next few years". It is the first time the financial sustainability of universities has been measured in this way. Concerns were registered about the long-term future of six institutions, while none were found to be high risk and six were deemed to be at low risk. This tells us that the finances of these universities are in a somewhat uncertain state and given that's half the sector in Wales, it's significant. Universities in Wales already have some problems - a deficit of around £70m, an annual funding gap with England of £65m and last week they were dealt a £50m cut to their budget by the assembly government, so some changes are necessary to keep them going in the long term. The assembly government hasn't set out its plans yet and I understand it will do so before Christmas, but given that all the universities want the fees to go up and given that they've had this budget cut, a rise in fees does seem inevitable, purely as a way of raising funds. The information was revealed in risk reviews conducted in May and was obtained under the Freedom of Information Act by BBC Wales. It comes a week after university funding was cut by 12% over three years in the assembly government's draft budget. Dr Peter Noyes, vice chancellor of the University of Wales, Newport, said all universities in Wales were lobbying Education Minister Leighton Andrew for an increase in student tuition fees. "It's the only way we can afford to support future cohorts of students to generate wealth in the economy," he said. "We've said that we will work with him to make sure that system is fair and appropriate for the needs of the Welsh economy." 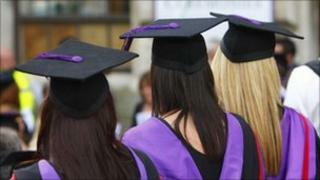 The UK government wants to increase tuition fees for universities in England up to £9,000 per year. The assembly government is expected to outline its position before Christmas. A spokesperson for Higher Education Wales which represents higher education institutions said Welsh institutions were "financially well run and there is no indication that any Welsh university is at risk". But the spokesperson added that following "significant cuts in public funding" there was "now a need to address the level of graduate contribution in Wales in order to ensure parity of investment with universities elsewhere." Peter Jones, national chairman of the University and College Union Cymru, said students were already contributing through the skills they offered society and the tax they paid once employed. He told BBC Wales: "In Wales we need to be more imaginative about the way we look at it and see if there are other ways of providing the services for students and in the long term the economy of Wales. "Our concern is that every student in Wales gets a proper education and that the university and college lecturers and our support workers get enough money to do the top quality research so the students can receive top quality teaching. "We are also concerned about compulsory redundancies among our members." Meanwhile, school and university students across Wales are taking part in a nationwide day of action against the planned fee rises and cuts in education. Organisers of action at Cardiff University say they expected "a few hundred" to attend their lunchtime demonstration outside the student union building. Student leader Sebastian Power said they were hoping it would put pressure on MPs who are due to vote on proposals for a increase in tuition fees. "It's very important for people to understand that one protest is not going to solve the world's problems," he said. "But it's about building pressure, especially on the Lib Dem MPs, many of whom pledged to vote against any rise in tuition fees." Pupils at Monmouth Comprehensive are planning to walk out of their classes, while students and lecturers at Aberystwyth University are holding lectures and seminars on the streets in the town's Bank Square from midday. Aberystwyth University organiser Kieran Ford said: "If the government wants to take university learning away from the masses by making it expensive and out-of-reach to ordinary people then we will take university learning to the masses. "It is important that people do not think this is simply a student protest. It affects the wider community." Katie Dalton, president of students' union NUS Wales, said they were not organising Wednesday's protests but were encouraging students to write to MPs urging them to vote against an increase in fees. "Research has shown that increasing the tuition fee cap to £9,000 will deter the very poorest from entering higher education and leave those who do with £40,000 of debt. "The strength of feeling on this issue is clear, with 2,000 Welsh students having marched peacefully against higher fees and members of the public outraged at the prospect of their siblings, children and grandchildren shouldering the full cost of higher education."